How far must one fall to have a mechanism for spine injury? We don’t know. It depends on the height of the fall, how you land, the surface on which you land, your age and other factors. As a guideline, the WFA and WFR Scope of Practice documents incorporate mechanisms based on the Canadian Spine Rule (JAMA. 2001; 286 (15): 1841‐1848.) They are primarily expert opinion, not validated by science. • Falls associated with loss of responsiveness/altered mental status. • High velocity impacts: (e.g., car/ATV crash, climbing falls, high speed skier/biker crashes). • Falls from greater than 3 ft (1 meter) landing on the head, back/side or buttocks. 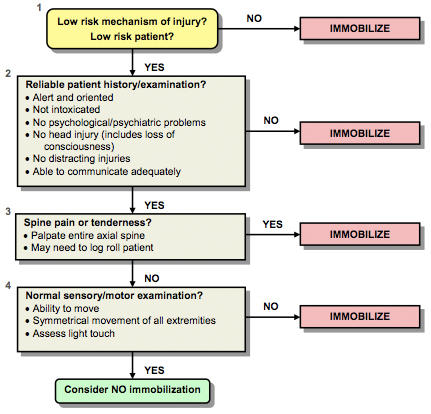 If you are unsure of the mechanism and/or the patient assessment does not find signs or symptoms of spine injury you can use the Focused Spine Assessment to gather information to aid your decision whether to continue to immobilize the spine.